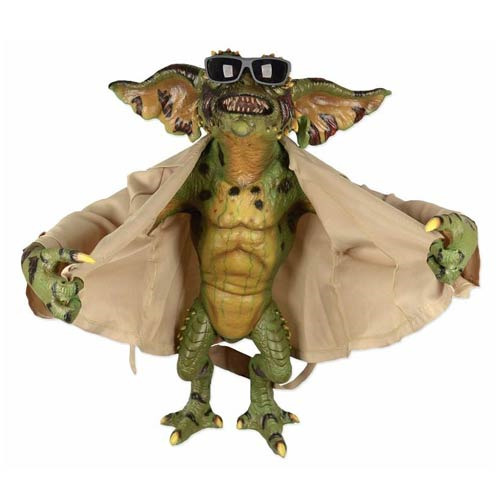 Authentic full-size replica of the Flasher Gremlin! From the popular Gremlins 2: The New Batch film! Hand-painted, with fabric trench coat and removable sunglasses. Would you like to own an authentic, full-size replica of the Flasher Gremlin stunt puppet from Gremlins 2: The New Batch? This hand-painted rubber and latex figure stands nearly 30-inches tall and features a fabric trench coat and removable sunglasses, all entirely faithful to Flasher's on-screen wardrobe in the movie. The Gremlins 2 The New Batch Flasher Gremlin Life-Size Stunt Puppet Prop Replica comes with a metal display stand. It's a sensational addition to your Gremlins collection! Ages 14 and up. Cover Your Eyes! This Flasher Gremlin Is on the Loose!